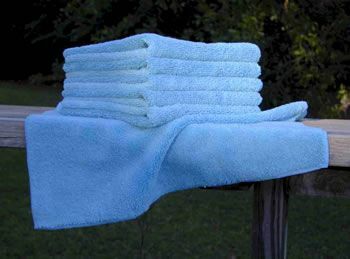 Microfiber Towels give you No Smears, No Scratches, No Chemicals! If your vehicle is clean, but the dust drives you crazy? Lightly mist any of our Microfiber Towels, hold a corner with each hand, and slowly pull across the surface. Every speck of dust is removed in one pass! Is your wax streaking? How about your window cleaner? Eliminate all of these frustrating problems with our Microfiber Glass Towel. Guaranteed to be lint free. This is the "miracle" of these towels. The Microfiber grabs airborne contaminants, grease, grime, and moisture from any surface. The miraculous fiber eliminates the need for cleaning solutions. Glass, stainless steel, chrome, paint, plastic, wood and tile may be cleaned with a simple rubbing motion. Use the towels for your car, boat, RV, motorcycle, or home. They are velvety soft and machine washable. Microfiber is hypoallergenic, super absorbent, and dries in half the time or ordinary towels. Our 80% Polyester and 20% Polyamide (nylon by-product) towels are available in several different weaves which provide very different features and benefits. Whether you use them for the home, car or office, Microfiber cloths will do the job better and faster than any towel you can buy. Don't be fooled by cheaper Microfiber towels. Most are thin and flimsy, and have coarse edges that are whip-stitched with synthetic thread.